“Not out” in cricket means a batsman remains in play and has not yet been dismissed. 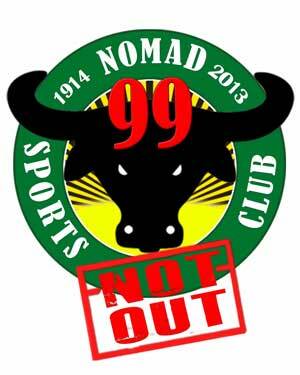 “99 Not Out” intends to show that the Nomads are still in the thick of things well into its centenary next year. It serves as a testament to the club’s strong resolve to stay alive, so to speak, and remain in the game for as long as possible despite the perilous journey that it went through during the past five years. The new logo will henceforth be included in all Nomads collaterals. Having survived the string of legal cases filed by former Nomads president Edward Du and Multi-sphere is in itself a cause to celebrate the year as an important milestone. Not to mention that the club has also the Second World War, the coup d’états of the late 80s, and the Asian Financial Crisis of 1997. Aside from the non-stop legal cases of the more recent past, NSC also had to cope with the normal struggles associated with running and maintaining a sports club. One more run this year and the great landmark is reached: 100 years, and counting. It is a feat that a year ago appeared difficult to achieve because of the onslaught of cases that began in 2008. NSC, however, remains steadfast in its resolve to continue its legacy and contribute to Philippine sporting history. Massive plans and preparations are being drawn for the club’s centennial which will open during the New Year celebration this December and will culminate in the Nomads Global Homecoming in December 2014.